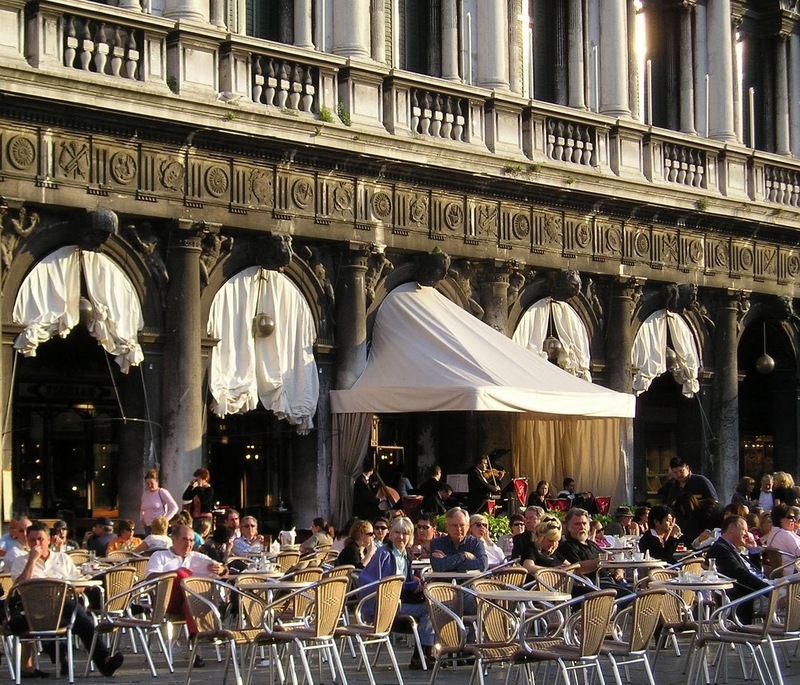 Anchored by its iconic Basilica and campanile, the Piazza San Marco – St. Mark’s Square – is as an essential part of Venice’s identity as its canals. 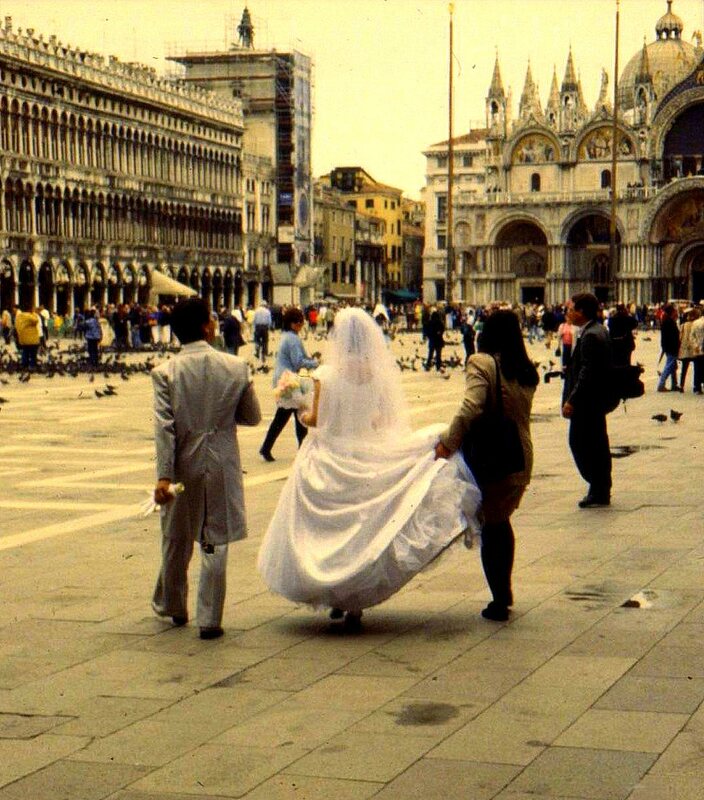 Its main entrance is the Piazetta corridor adjacent to the Doge’s Palace that connects it to the Grand Canal. 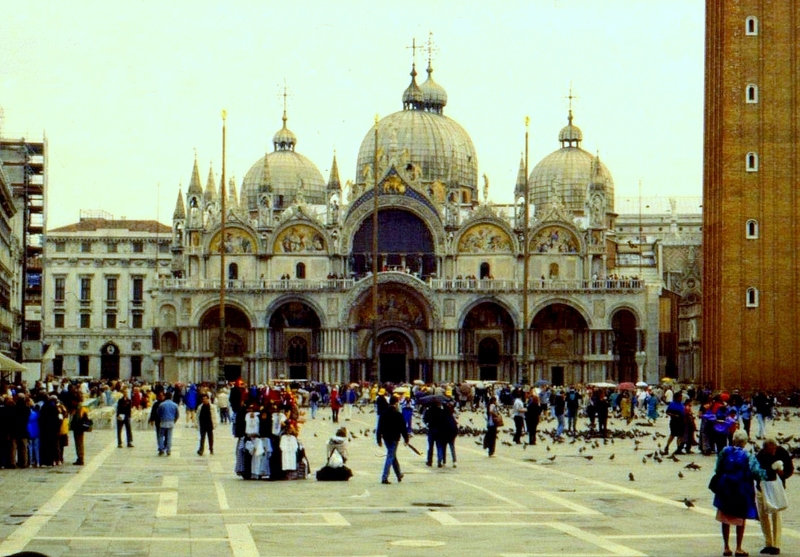 The Basilica San Marco reflects the conviction held by Christians in the Middle Ages that physical remains of a holy site or person had healing powers, and that possession bestowed honor and privileges upon their owners. 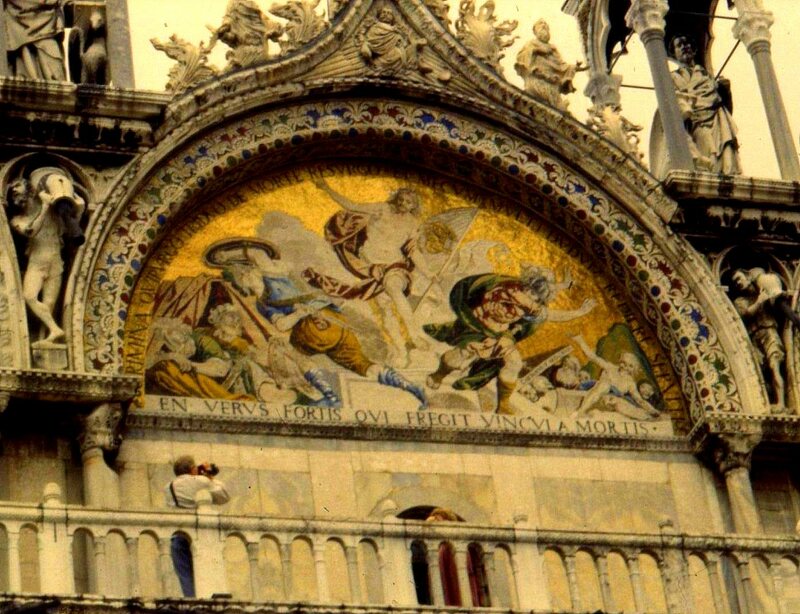 Tradition holds that St. Mark Christianized Venice in the first century before his martyrdom in Alexandria, Egypt, from which a body believed to be his was stolen by two Venetian merchants in 828. 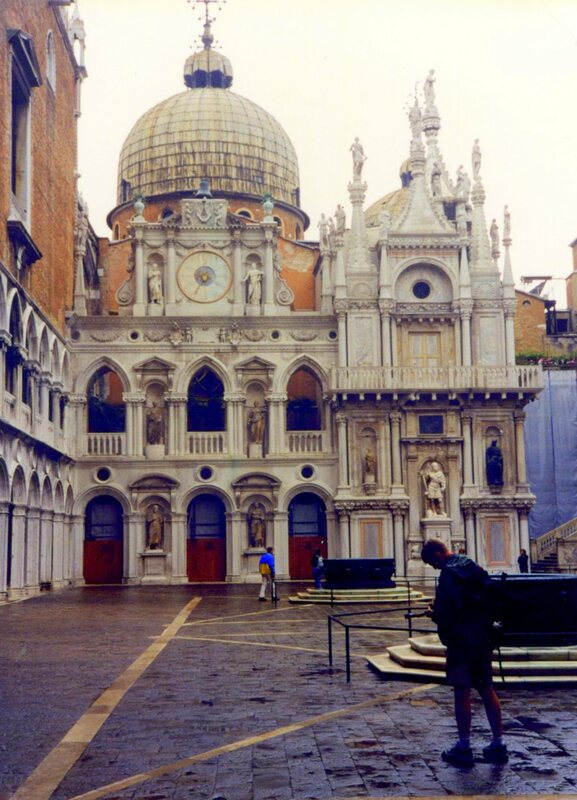 The city quickly adopted St. Mark as its patron, and built the first church of San Marco as its sanctuary. It also adopted the saint’s winged-lion symbol as its own. 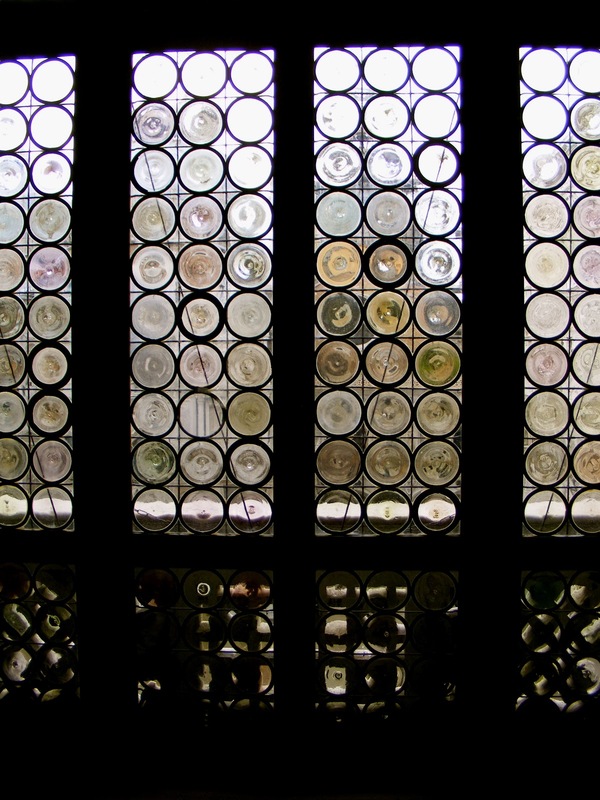 When Constantinople was sacked during the 4th Crusade, plunder shipped back to Venice included the two pillars which still stand where the Piazzetta meets the canal, along with marbles and mosaics installed on the Basilica’s west facade. The booty also included the bronze Triumphal Quadriga – the “Four Horses of Saint Mark”. 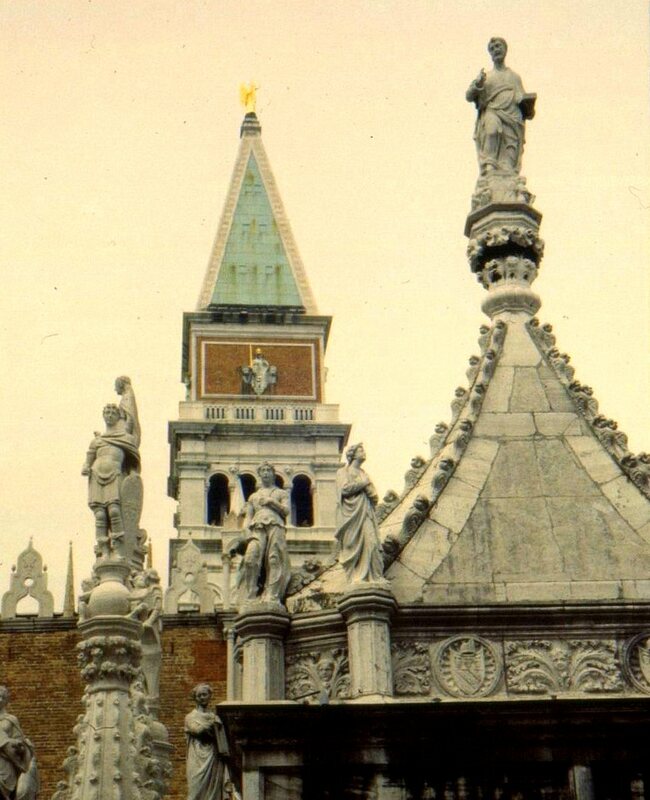 Originally part of a larger Roman monument, they stand on the Basilica’s loggia above the porch. It’s an interesting bit of trivia that the heads were detached in order to transport these bronzes, and collars were added to hide the cuts during reassembly. 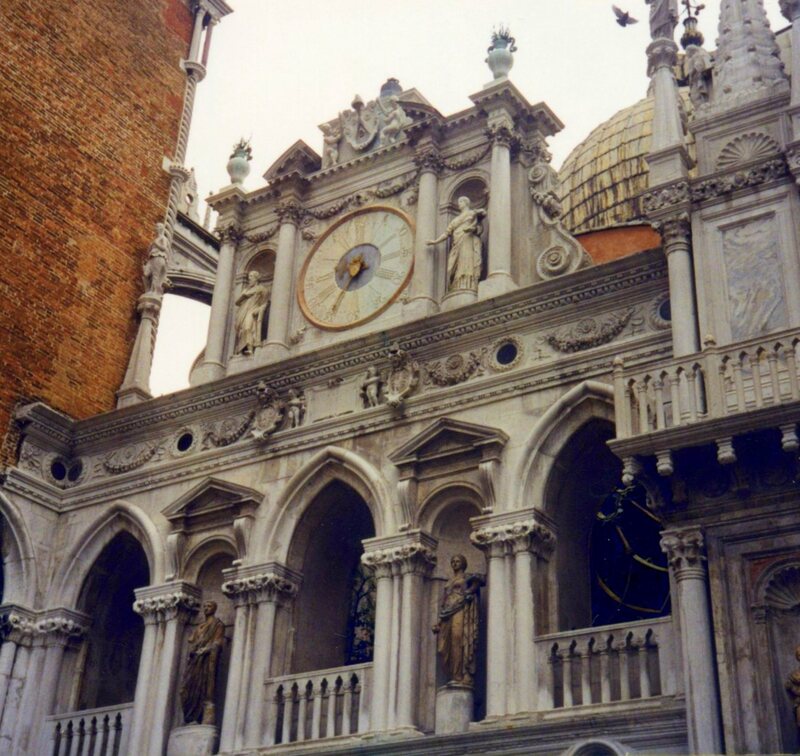 In the late Renaissance, the original campanile was replaced to house a new astronomical clock, and the Piazza was enlarged to its present size. 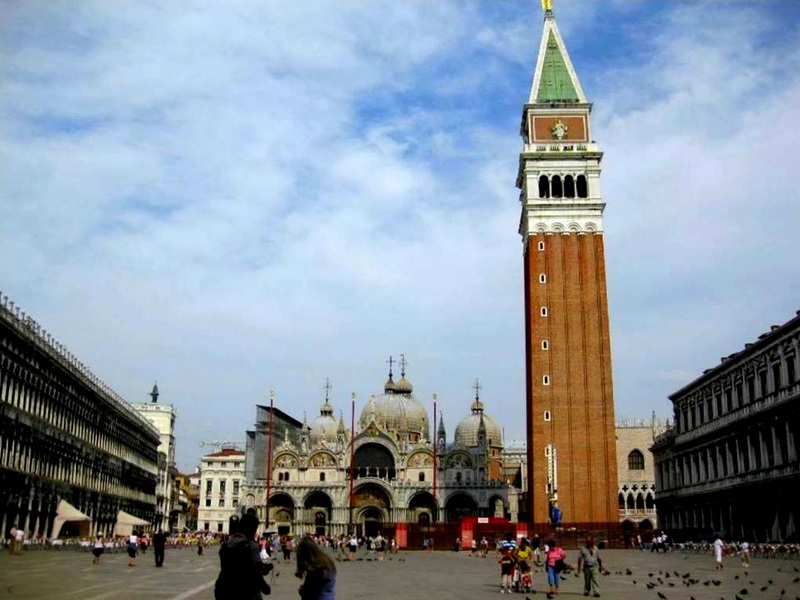 Today, the only pre-Renaissance buildings and monuments still standing are the Basilica San Marco, the Palazzo Ducale – the Doge’s Palace – and the two great columns in the Piazzetta adjacent to it. 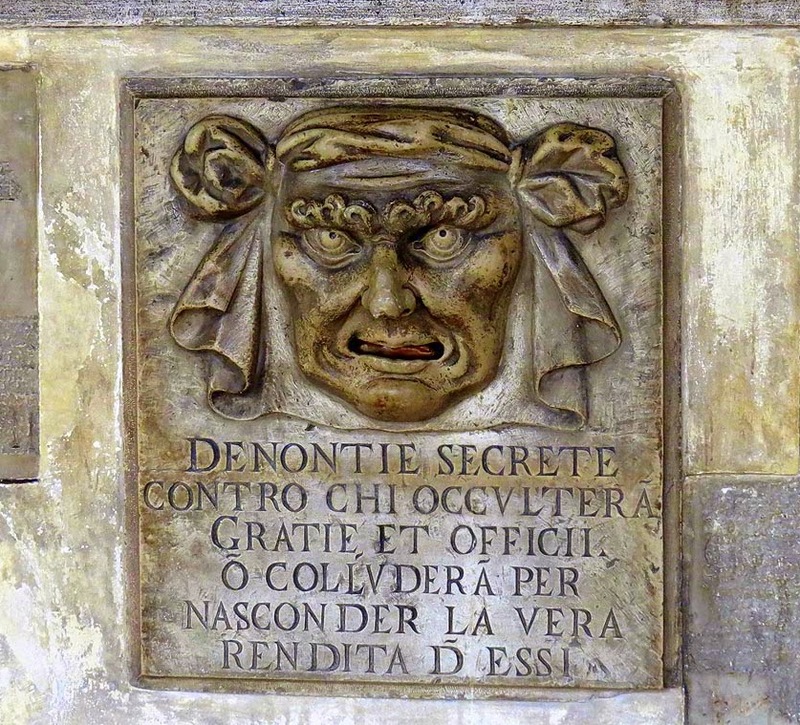 When the Venetian Republic ended with Napoleon’s conquest 1797, stonemasons were ordered to destroy images of the winged lion, which Revolutionary France saw as a symbol of aristocratic rule. 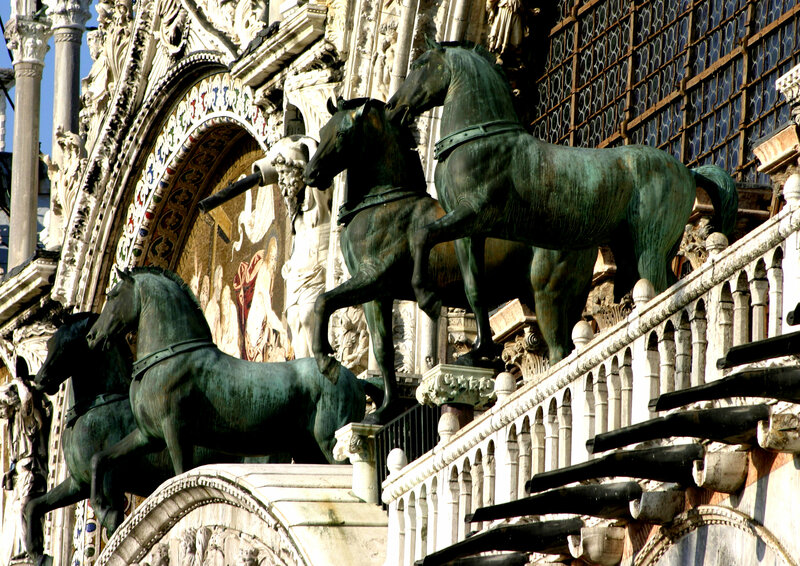 The Four Horses were sent to Paris along with the winged lion perched on one of the columns in the Piazzetta. The headless statues were later replaced by copies, and both the winged lion and Four Horses were returned in 1815 following Napoleon’s abdication. 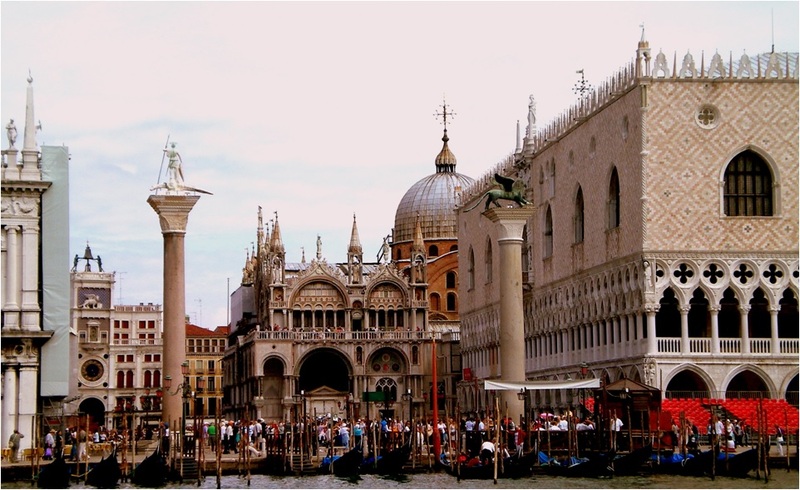 The Palazzo Ducale – the Doge’s Palace – faces the canal adjoining the Basilica and the Piazzetta. It was not just the Doge’s residence, but the center of government. It was here that foreign delegations were received and from here that communications with ambassadors and regional governors were managed. It was here that the meetings of the Great Council and the Senate were held, and from here that justice was administered. It was from here that recruitment of crews for Venice’s war galleys and the outfitting of its fleet were coordinated. While the Doge served for life, the Republic maintained a strong system of checks and balances. It is a testament to this ingenious system that the Council was compelled to remove only two of the 120 Doges who served continuously from 717 to 1797. The Great Council was made up of all male members of patrician families over the age of 25. Smaller councils carved from it had responsibilities including assuring punishment of the guilty, redress for the innocent, and enforcement of regulations concerning the practice of law. 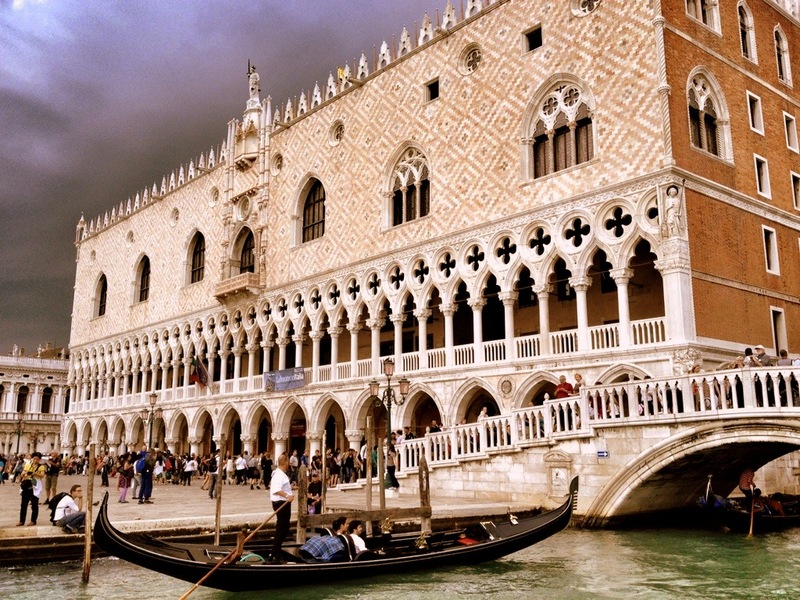 The Venetian Senate dates back to the 13th century. State Censors were charged with preventing electoral fraud and protecting public institutions. State Advocates safeguarded the rule of law and verified marriages and births to preserve the legitimacy of the patrician ruling class. The Doge’s private apartments are well-appointed if not large. The walls of the Palazzo’s rooms are covered in gilded wood, frescoes, and paintings by Renaissance masters. 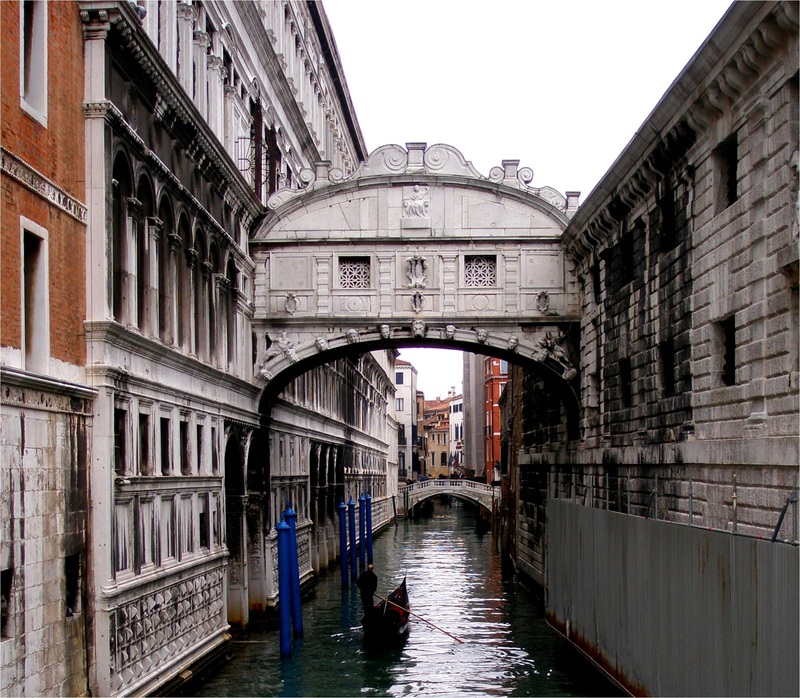 The Ponte dei Sospiri – the Bridge of Sighs – links magistrates’ chambers in the Palazzo Ducale to the New Prisons, from which Casanova is reputed to have escaped. The bridge’s name refers to the last look at freedom it afforded to those on the way to prison. Local legend holds that lovers kiss on a gondola at sunset under the bridge as the campanile’s bells toll will be granted eternal love and bliss. 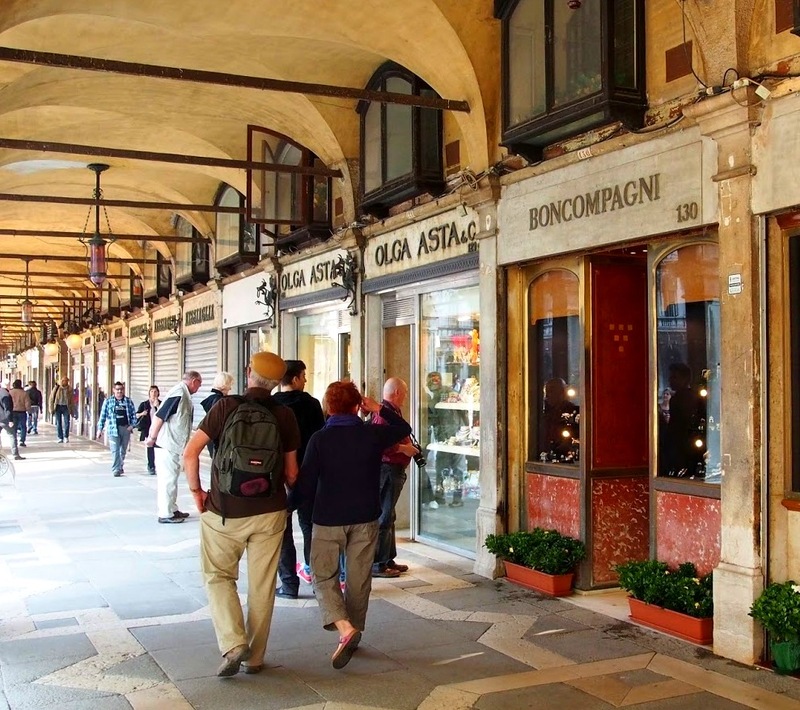 Tomorrow it’s back to the Italian mainland, and on to Padua by autostrada.